Today is Presidents Day, the day we honor the people who have held our nation's highest office. I'm skeptical of this holiday - not all of them were so great. I preferred honoring the greats with a day. We used to celebrate the birthdays of Washington and Lincoln, and that was enough. We shouldn't add to the list so lightly. Besides I'm not sure there is another president who can join them. Jefferson was undoubtedly a great man - but also a problematic one. Same with FDR. I'm not sure there is another president who really comes close. A few years I spent some time considering the question of who was our greatest president - outside of the presidency. That is, who had the most distinguished post-presidency, who performed the greatest public service, the greatest work outside of politics, and the most successful military career. I won't recapitulate my findings, give it a read here. But I thought I would do the same this year for vice presidents. Who was our greatest VP? What does that even mean. Jefferson and Roosevelt are on Mt. Rushmore, they make everyone's list of presidential greats. Johnson and Truman both had pretty big accomplishments in office, which at least balance the wars they stumbled into. 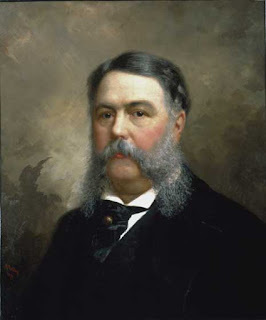 I have a soft spot in my heart for Gerald Ford and Chester Arthur. Neither sought the presidency or vice presidency. But when placed in the role, both rose to the occasion and helped heal nation move past a divisive moment. Ford's story is well known. Arthur's has some similarities. He was member of the political machine of New York Senator Roscoe Conkling and head of the New York Customs House. This was a huge job when tariffs were the primary source of federal government revenue - and yes, there was ample room for corruption. When Conkling was denied the presidency, Arthur was nominated to the vice presidency in a move by party leaders to reconcile with Conkling's faction. Conkling told Arthur to refuse the nomination, Arthur accepted and the Republican Garfield-Arthur ticket won the 1880 election. In office, Arthur continued to work on behalf of Conkling. Garfield was assassinated in July 1881 by Charles Guiteau, who thought he deserved a job in the administration. This was back when federal jobs were patronage positions handed out by the president and the cabinet. When Conkling approached Arthur about how they were going to run things, Arthur rebuffed his patron. Instead, Arthur pressed for Civil Service reform, which had been one of Garfield's causes. As president Arthur was prudent, careful, and generally respected. He was also seriously ill and concealed it. There was nothing in Arthur's background suggesting he would be president or be capable in the position - but when the moment came he served admirably when the United States needed it. While these may have been great men - they were not great VPs! Most of them spent little time in that office. Only Jefferson spent a full term as VP, and he spent it as far away from President Adams (his political rival) as possible. Jefferson of course wrote the Declaration of Indepence, as well as serving as ambassador to Paris and Secretary of State. Martin Van Buren built the modern Democratic Party. Biden and Humphrey were long-time Senators with lengthy lists of accomplishments. Cheney served as White House chief of staff, was a much admired congressman, and a well respected Secretary of Defense. It is hard to remember that when Cheney was nominated to the vice presidency, the choice was generally lauded. Besides Cheney, Van Buren and Biden played significant roles as vice president. This list by the way is off the top of my head. I don't know my 19th century VPs as well as I should, but I'm sure some of them were well respected before taking our nation's "most insignificant office." Jefferson was a scientist, philosopher, architect, and founded the University of Virginia. TR was a naturalist, explorer, and historian of some renown. Henry Wallace did important work in agricultural science before serving as FDR's Secretary of Agriculture. Levi Morton was a business giant, after his term as vice president merged his interests with J.P. Morgan. Charles Dawes is my favorite. He was a successful businessman, held a range of government posts, won a Nobel Prize for his work on German debt relief after WW1, and wrote Melody in A Major. This last was set to words in 1958 and became the hit Tommy Edwards song, It's All in the Game. None of these men were particularly distinguished vice presidents. Dawes main accomplishment was sleeping through a key Senate vote where he was supposed to break the tie. Wallace got into squabbles with members of FDR's cabinet. None of the lists so far have much to do with the vice president as the vice president, but rather the individuals who held the office. What can we say of the efforts of vice presidents as vice presidents. We could rate the most influential VPs. Cheney is probably top, but the other modern VPs, particularly Gore were pretty important. There were also a few fascinating earlier cases of vice presidential influence. Maybe I'll do another post on this. But I'm thinking about someone who exercised the extremely limited formal role of the vice president as well as possible. In many cases, this role is characterized by doing nothing when the nation is in crisis or the president's status is in doubt. Thomas Marshall refrained from acting when President Wilson was incapacitated with a stroke. Ford was careful and quiet as Watergate heaved to its close (as was Gore during the Clinton impeachment.) Nixon performed admirably, chairing cabinet meetings without appearing to usurp the president, when Eisenhower was ill. Bush 41 did the same after Reagan was shot. But this is negative. I can think of one, rather profound, case where a vice president used his formal powers in a way that was significant - shaping U.S. history for centuries. He may have been a scoundrel, but Aaron Burr did something important as vice president. He protected the independence of the judiciary. Read the whole story here.